PMR analyzes the global Biodiesel market in its new publication titled ‘Biodiesel Market: Global Industry Analysis 2013-2017 and Forecast 2018-2026’. This study offers thorough analysis and key insights pertaining to the target market on the basis of feedstock type, application and region for the historical period 2013 – 2017 and forecast period 2018 – 2028. The main objective of the report is to ascertain the dynamics involved in the Biodiesel market and provide key information regarding the several segments of the global Biodiesel market. To support the major stockholders in strategic decision making and market analysis, the biodiesel market report comes incorporated with the analysis of various market dynamics, such as drivers, trends and restraints, among others factors that influence the current market situation and are expected to have a significant impact on the biodiesel market over the forecast period. This report will help to comprehend the biodiesel market dynamics and provides data for 2017 along with an inclusive market forecast for the period 2018–2028. To comprehend and determine Biodiesel market opportunities and trends, the global Biodiesel market report has been categorized into different sections on the basis of feedstock, application and region. The report initiates with the market introduction, which includes market taxonomy and definitions. In the next section i.e. market overview, macro-economic factors, end-use industry growth, value chain analysis, market dynamics & pricing analysis w.r.t. regions, among others, have been incorporated. In this section, the Biodiesel market background has been discussed in detail. The impact of several factors that affect the Biodiesel market, such as macro-economic factors, which include region-wise automotive sales and vehicle parc, crude oil consumption, production and outlook w.r.t. region, has also been discussed. The market background section covers market dynamics and their impact on the global Biodiesel market. The dynamics covered in the global Biodiesel market report include drivers, restraints and trends. In the value chain analysis section, a comprehensive overview of market value chain and the flow of biodiesel from raw materials to end users has been included along with an exhaustive list of manufacturers. The final part of the Biodiesel market report is the forecast factors and their impact analysis. The next section include global Biodiesel market analysis by feedstock, application and region/country. All these sections assess the market on the basis of several factors affecting the Biodiesel market. Each section discusses the qualitative and quantitative aspects of the global Biodiesel market. To give an overview of revenue opportunities by application, feedstock and region/country-wise segments, the report also provides market value (US$ Mn) and volume data, market shares, growth rates and total incremental $ opportunity indices for each segment over the forecast period (2018–2028). In the last section of the biodiesel report, we have provided an exhaustive competition landscape with key manufacturers’ market share and their performance to offer report audiences with a dashboard overview of major players operating in the global Biodiesel market as well as their business key strategies. This would enable clients to gauge strategies being used by key market players and use this information to develop their own effective strategies accordingly. For the assessment of Biodiesel market size, 2017 has been considered as the base year, market numbers have been estimated for 2018 and a forecast has been developed for the period 2018–2028. To determine the market, we ascertained the biodiesel production in each region and the production capacity of players present in every region/country. PMR assessment is based on a multipronged approach that encompasses secondary and primary research and triangulation of data obtained therefrom. During the initial phase of research work, we prepared an exhaustive list of manufacturers w.r.t region/country and also identified the feedstock consumed for the production of biodiesel w.r.t. country. Further, during secondary research, information & data available in public domains, such as company presentations, industry associations, company annual reports, publications, white papers, government sites and scientific journals, among others sources, was collected and thereafter, a set of data points were built. For the same, a top-down approach was used to gauge market numbers for different feedstock & applications and a bottom-up approach was used to counter validate the market estimation. For forecast assessment, growth outlook for end-use applications, such as blending scenario, vehicle production, vehicle parc, was taken into account. The forecast presented in the report evaluates the actual market size (US$ Mn) in 2017 and projects the market values for the global Biodiesel market for the forecast period. We have also scrutinized the different segments of the global Biodiesel market in terms of basis point share (BPS) to comprehend each individual segments’ relative contribution to the Biodiesel market growth. This thorough level of information is crucial for identifying several key trends governing the global Biodiesel market. The report also investigates the global Biodiesel market on the basis of incremental $ opportunity. This is often overlooked while quantifying the market forecast. Moreover, from a business development perspective, it is vital to identify that market attractiveness in terms of three indices, viz. CAGR index, market share index and incremental $ opportunity index, to identify the high potential resources in the Biodiesel market. 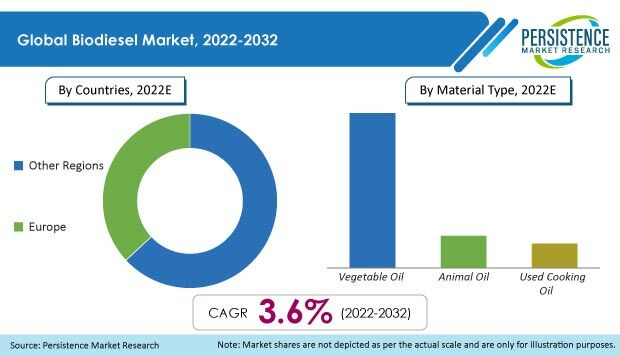 Moreover, the market attractiveness index is important to understand the key segments in terms of their growth and performance in the global Biodiesel market. This market attractiveness index help clients to identify real market opportunities in the global Biodiesel market. Biodiesel, also referred to as green diesel, is a clean renewable fuel derived from biomass. It is a long-chain mono-alkyl ester of fatty acid produced from vegetable oils or animal fats. Biodiesel is an alternative fuel having similar characteristic properties to petroleum diesel. Generally, it is used as an alternative fuel or blended together with petroleum diesel. Biodiesel can be produced from a wide range of feedstock such as vegetable oil, animal oils/fats, and used cooking oil, among others. Around the globe, biodiesel is blended with petroleum feedstock in the proportion of B2 (2% V/V), B5, B10, and B20, among others. Commercially, Biodiesel is produced by Trans-esterification or hydrotreated vegetable oils (HVO) process. The global biodiesel market has been segmented into vegetable oil, anima oil and used cooking oil (UCO). Biodiesel finds application as a fuels in automotive, industrial fuel, marine fuel, power and agriculture industries. The global biodiesel market is estimated to be pegged at around US$ 28.9 Bn in 2018 and is projected to register a CAGR of 3.1% over the forecast period (2018–2028). According to the Organisation Internationale des Constructeurs d'Automobiles (OICA), automobile production has been growing at a rate of around 3% annually since 2012. Global automobile production stood at 95 Million Units in 2016, comprising both passenger and commercial vehicles and grew steadily to 97 Million Units in 2017, registering 2.4% Y-o-Y growth. Moreover, in terms of sales, diesel engine vehicles account for ~19% of the total vehicles around the globe and thus, hold a significant share in the global vehicle parc. Diesel fuel with a high cetane number provides better fuel efficiency and high reliability. However, the use of diesel fueled vehicles results in Sox, NOx and CO2 emission and other greenhouse gases, which are hazardous for the environment, ecosystem and humankind. Along with this, several countries depend on the import of crude oils to cater to the increasing demand for diesel fuels. This ultimately affects the economy of a country. Also, to evade economic losses, owing to the import of crude oil and reduce emission of pollutants, governments of developed and developing countries have mandated the blending of biodiesel with diesel fuels. Attributing to this, the demand for biodiesel is expected to increase over the forecast period. Also, growing crude oil prices, OPEC countries have channelized efforts to reduce crude oil production, which in turn expected to boost the demand for biodiesel over the forecast period. Thus, the demand for biodiesel is expected to witness steady growth, owing to the increasing energy needs, rising crude oil prices and growing demand for clean and renewable sources of energy around the globe. Moreover, the availability of feedstock and low cost are major factors supporting the growth of the biodiesel market. However, fluctuating feedstock price may hamper the growth of the biodiesel market. In the biodiesel market, it has been observed that the preference of key manufacturers has been moving towards the used of the Hydrotreated Vegetable Oil (HVO) techniques for biodiesel production as it yields valuable by-products as compared to the traditional method. From a regional perspective, the biodiesel market in Europe is projected to witness relatively steady growth remain dominant in the global biodiesel market over the forecast period. This can mainly be attributed to the mandatory blending of biodiesel and the expected increase in blending percentage in the coming years. Moreover, the South Asia and Oceania Biodiesel market is expected to represent a significant incremental $ opportunity between 2018 and 2028. Growing vehicle parc and increasing biodiesel blending percentage in diesel fuels are expected to drive the demand over the forecast period. The North America biodiesel market, on the other hand, is projected to expand at a substantial CAGR, in terms of volume and value, over the forecast period. Some of the players reported in this study on the global biodiesel market are Royal Dutch Shell plc., Neste Oyj, Archer Daniels Midland Company, Bunge Limited, Louis Dreyfus Company B.V., Wilmar International Limited, Repsol S.A., Total S.A., China Petroleum & Chemical Corp (Sinopec Corporation), Cargill Incorporated, RB Fuels, and Renewable Energy Group, Inc., among others. Biodiesel manufacturers are channelizing efforts towards increasing their production capacity and are emphasizing on specific regions to cater to regional demand. This is expected to positively impact the biodiesel market in the coming years.